Amanda over at 'Mommy of Two Little Monkeys' was gracious enough to nominee Paris Pastry for the Stylish Blogger Award. Thank you so much Amanda! 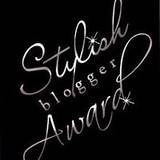 With this award I will share 7 things about me & nominee some other very stylish bloggers who inspire me! 1. I’m 23, live in the Netherlands, I’m half Dutch and half African-American. 2. Yesterday I went to the movies and saw ‘The Tourist’. Worst. Movie. Ever. Can I get refund? 3. Sunday breakfast is a ritual for me. Today I had blueberry pancakes with powdered sugar. 4. I recently redecorated my bedroom. I can’t seem to get out of my new feather duvet-covered bed in the weekends. 5. I’ve played Adele’s Rolling In The Deep so many times on my ipod, I’m sure I’ve broken the replay button. 7. My next post will be the Best Chocolate Cake Known To Mankind. And thank you to these fabulous food-bloggers for constant inspiration! So nice to know more about you! Love your blog! I am going to try the chocolate cake for sure! What could be better than a moist piece of chocolate cake with a scoop of vanilla ice cream alongside? Says love. thank you for thinking of me, I was just about to do a quick post (lots of cupcakes at the end of the week for me). so I'll post this as well. Well done on your award! It's definitely accurate. I love your blog (actually, I love both of your blogs). Ps. I'm so jealous. A trip to Paris? I die! Thank you so much, Danielle! And I love learning more about you. That trip sounds ah-mazing! I'm a bit jealous ;p. And I have never planning to see The Tourist but it's good to know I shouldn't. Can you believe the nominations it's gotten?